Work directly on your InterSystems IRIS, Ensemble and Caché source code. Browse the contents of namespaces on your InterSystems servers. You can explore classes, MAC, INT and INC routines. 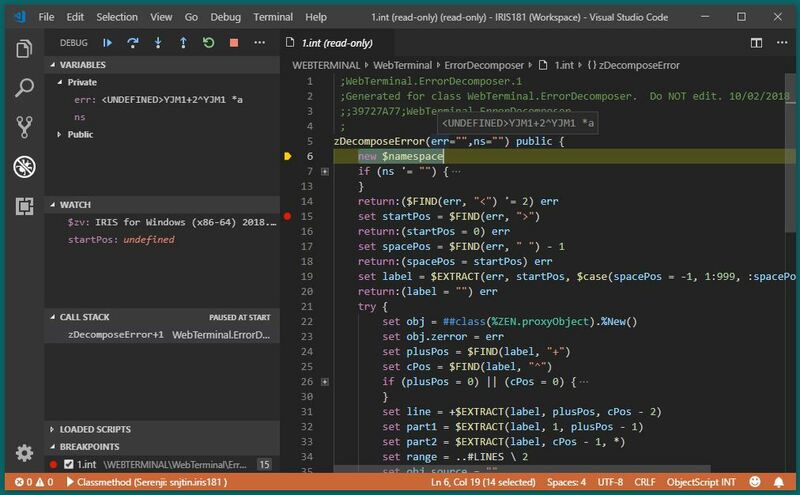 Serenji is available on Marketplace as an extension to Visual Studio Code. Install VS Code (it's completely free), launch it, go to the Extensions view, then enter the search term 'Serenji'. More instructions here. The File Explorer and Editor capabilities of Serenji are free to use. To use the Debugger capabilities, buy a license online. A free thirty-day evaluation license is available on request. Looking for other versions of Serenji (e.g. for GT.M / YottaDB servers, or for advanced Ensemble debugging)? Click here.